A series of trends investigating how visual and interaction design patterns will change according to the broader trends in society, technology and the design realm. By Sarmite Polakova and Audrey Cruchade, designers at Digital Agency Mirabeau. Illustration by Koen Huiskamp, designer at Mirabeau. Speculative design? Yeah, its really cool but it’s for artists, museums and science fiction movies. It doesn’t fit the practical needs of our clients. These are the main conclusions most creatives draw when talking about speculative design. Yet, did we forget that many of the technological achievements in the last few decades were once just ideas grasped at in science fiction literature long before they became a reality? Within design agency work, speculative design is not a widely-recognized design method due to the vague set of rules, unclear end goal, and unpredictable outcomes. However, we have learned over time that the well-oiled Design Thinking method to solve clients’ needs lacks innovation and far-reaching conclusions. That happens because most of the process gets spent on functional needs, leaving design only a decoration. Furthermore, decisions are made focusing on the product rather than on how it affects other parties besides the picked users. In an era when products and ideas have very short lifespans, when algorithms predict what people will want to do, desire, and think next, we need to permit ourselves to speculate on alternative scenarios, opportunities and possible problems in order to evaluate where the current developments are bringing us. Even Microsoft, Google and Apple hire sci-fi writers in order to accelerate their innovation curve. When working with technology we regularly think about “the future.” What speculative design does – it uses the idea of possible futures and creates artefacts in a future scenario, based on current trends. Basically, it is about testing the current idea in a future scenario and then bringing it back to Here and Now. This allows us to understand the impact of our actions and to trigger a debate as well as a critical reflection. Speculative design helps to reveal things that are happening right now, in front of us, but which we never managed to turn the angle on in a different way. 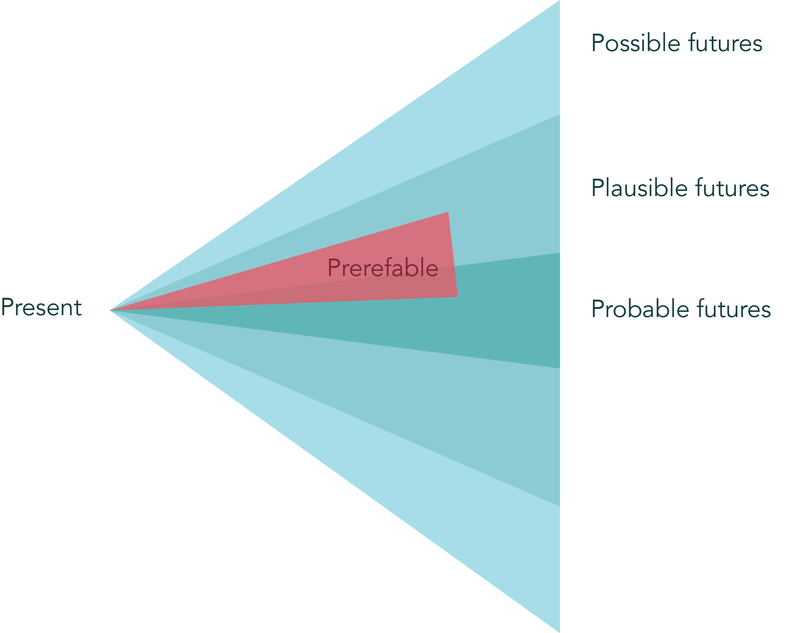 Anthony Dunne and Fiona Raby in their book, Speculative Everything, propose a taxonomy of futures showing multiple possible futures where some are more possible, some plausible, some probable, and some preferable. The Taxonomy of futures according to Anthony Dunne & Fiona Raby, the authors of Speculative Everything book. By focusing on all actors involved within the innovation it becomes possible to get a bigger idea on the actual scale of implications. If these questions were asked at the time of inventing AirBnb, we would have foreseen that problems occur for residents with less income. Design Thinking is great for details but often limits the design response to fixing an obvious problem. Pairing human-centered design with speculative design can inspire more original and more forward-looking solutions. A growing number of studios have added speculative Design services to their set of skills in order to help clients innovate. Studio Wé, for example, wrote a detailed article with practical steps on their experience using speculative design as a methodology with their clients. Predictive technology today informs your searches (Google), what you want to watch (Netflix), what you will buy (Amazon) and who your friends are (Facebook). This work explores how forecasting through simulations and the modelling of human behaviour might influence the way we manage and maintain relationships. 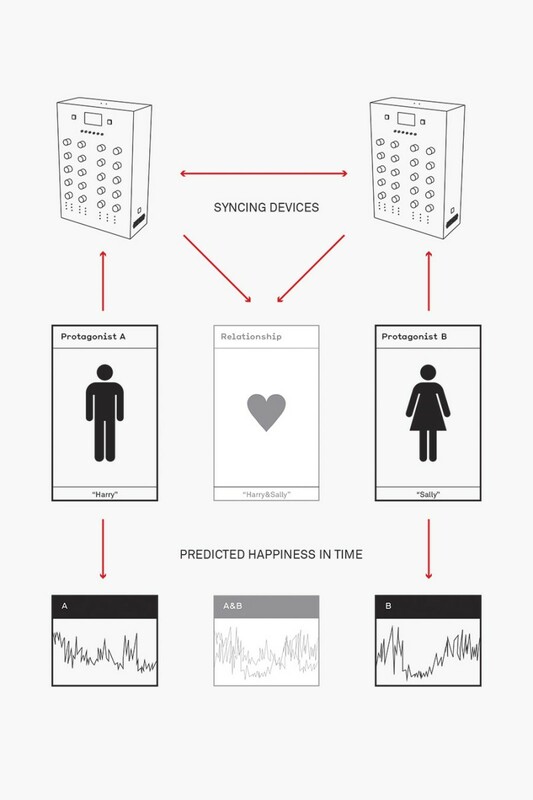 This machine predicts the satisfaction in time one can expect to get out of a given romantic relationship. Project and photo courtesy: Romantic relationship simulator Daniel Tauber. Let's now twist the angle and look at how other actors are involved in the designing of technology. For example, everyday products are slowly equipped with sensors, All, and data gathering mechanisms focusing on our behaviour. Yet mainly the angle we focus on is the perspective of the human and how to enrich their life. Iohanne Niceboim, designer and researcher explores poetic interactions between humans and technology. In her project, “Objects of Research”, she uses speculative design in order to twist the conversation about Internet Of Things. She focuses on the “things” as autonomous machines adjusting to complex situations without our intervention. This way she raises the question whether we are the actual objects of the Internet Of Things. Niceboim proves that everyday objects and products can also be a provocation and conversation-starter to explore social and technical relationships. This becomes particularly interesting in UX design, where our digital gadgets are beside us constantly. This would mean that we would consider both people and things in our studies and design process. Perhaps then the question we should ask is not: ”how might we..” but rather: “how might my kettle..” Why it is also important to think from the perspective of things is because the function of our everyday objects constantly changes. Just like a regular glass that we drink from can be turned upside down to catch a spider, our gadgets constantly morph into new functions. Just Google: “how to use my phone as…” and be assured we use our phones as many different objects. To conclude, this trend doesn’t aim to suggest that speculative design is going replace the regular Design Thinking practice. Instead, given the shortcomings of design thinking, we explore how it could benefit from speculative design methodology. Speculative design reveals parts of our reality that we weren’t aware of before and once it’s revealed, it’s so obvious that it cannot be ignored anymore. Furthermore, it gives the space to evaluate the desired innovation in a way that allows shaping the future in a positive way. Any design decision shapes future in some ways. Let’s dive in the unknown! By Sarmite Polakova and Audrey Cruchade, designers at Digital Agency Mirabeau. A series of trends investigating how visual and interaction design patterns will change according to the broader trends in society, technology and the design realm.